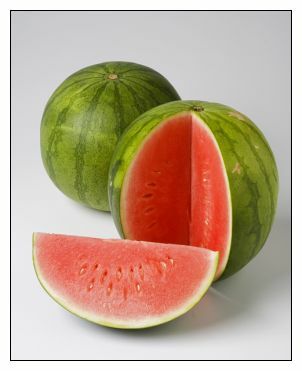 Watermelon is a vine-like (scrambler and trailer) flowering plant originally from southern Africa. Its fruit, which is also called watermelon, is a special kind referred to by botanists as a pepo, a berry which has a thick rind and fleshy center. Pepos are derived from an inferior ovary, and are characteristic of the Cucurbitaceae. The watermelon fruit, loosely considered a type of melon – although not in the genus Cucumis – has a smooth exterior rind (usually green with dark green stripes or yellow spots) and a juicy, sweet interior flesh (usually deep red to pink, but sometimes orange, yellow, or white).